When you want to store your digital image files affordably and conveniently, copy your files to a CD-ROM, using a CD burner (this figure shows an external CD burner). Burning digital photos onto a CD gives you a portable storage device that can be used on many computers. 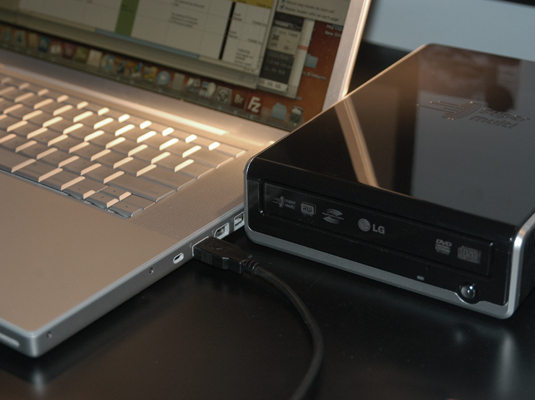 If your computer doesn’t have a CD burner, you can attach an external one to copy your image files. Most CD burners include a wizard that walks you through the process of copying your images to a CD, so you don’t need to be a technical guru to get your digital photos onto a CD. Some compatibility issues exist so that some older computers can’t read some types of homemade CDs. Even with the software wizards to guide you, you still have to deal with plenty of new and confusing technical terminology when choosing recording options. Just to be extra safe, burn two copies of CDs that contain your most precious photographic memories. Don’t use a permanent marker to write labels directly on the discs. So, if techno-babble intimidates you and the occasional unexplained glitch tempts you to put your fist through your computer monitor, you may prefer to let the professionals do your CD burning. Most retail photo labs can burn digital image CDs from camera memory cards.